Become part of a great student community that will make you feel like the University of Bath is your home away from home. You can live on the campus or in the heart of the city, in catered or self-catered accommodation. We manage 3586 bedrooms on campus and 944 in the city. We have a further 344 bedrooms that are privately managed by Hello Student. Our accommodation is specially designed with all students in mind. You can pick somewhere to suit your budget and your lifestyle. If you have a disability or medical condition, let us know and we'll consider your needs when we look at accommodation applications. No matter where you are, you're never far from transport links with regular buses between campus and the city centre. If you choose self-catered accommodation, you can cook for yourself and your flatmates in a communal kitchen. Postgraduates can only apply for self-catered accommodation. 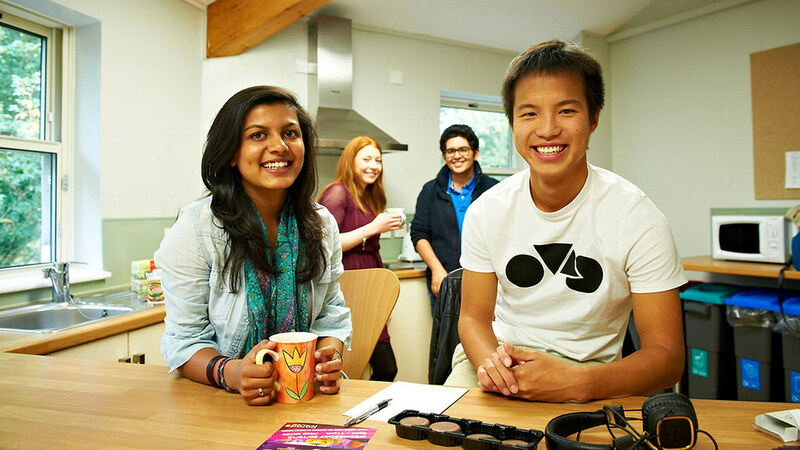 If you're an undergraduate you can apply to stay in catered and part-catered accommodation. Here, you'll be able to use Eat and Drink Credit to buy yourself meals from the range of outlets on campus. If you are an eligible student and apply by the 1 July deadline, we can guarantee you accommodation. The number of options you have will vary based on your course and level of study. We’ll do our best to place you in your preferred room type, but we cannot guarantee this. If you choose one of these options, it’ll be considered together with your room type preferences, although it is not guaranteed. We are committed to providing a safe and happy environment for students to live in, whatever their choice of accommodation. We value diversity and inclusivity and want everyone to be treated with respect. You may prefer particular accommodation if you are transitioning gender. You should apply using the additional requirements form so we can do our best to meet your needs. We may be able to place you in an en-suite bedroom or a studio. Bath is considered one of the safest cities in the world and our campus is safe too. In 2018, the University was ranked second safest in the UK in the Times Higher Education Student Experience Survey. We have also been accredited by the Association of Chief Police Officers as a secure environment. If you live in our accommodation, you will often see our Security team on patrol. You can only access your accommodation with your specially programmed library card and keys. This system helps to keep you and your belongings safe. There is also CCTV on campus, in public areas of accommodation and around the University. You will get contents insurance that covers your property against fire, theft and damage. If you are an eligible first year undergraduate and apply by the 1 July deadline, you are guaranteed accommodation. If you are an eligible overseas postgraduate student and apply by the 1 July deadline, you are guaranteed accommodation. You will need to choose seven room types when applying for your accommodation. If you are a UK or EU postgraduate we cannot guarantee you accommodation, but you can apply to go on our waiting list. You will need to select five room type preferences on your application. If you are an MA Contemporary European Studies, exchange or visiting student, you will need to choose two room types when applying for accommodation. You will need to apply for your undergraduate or postgraduate accommodation separately. We also have accommodation available for couples and families with up to two children. If you've got all the information you need to make your decision, find out what you need to do to apply for accommodation.